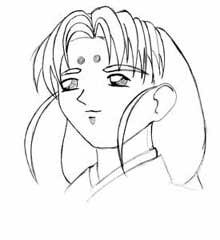 In this tutorial, I will show you how to draw Tsunami from "Tenchi Muyo." 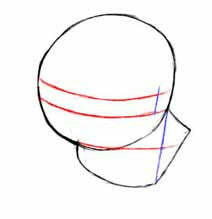 Begin by drawing a large circle, and divide it up with guidelines as shown. Be sure to draw the guidelines very lightly, because you want to be able to erase them when you are done. In this particular picture, Tsunami is looking up, so her face is going to be drawn from a slightly different angle than if you were drawing a standard 3/4 view. 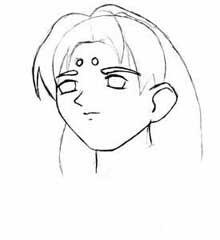 When drawing the lower half of the face, try to make the lines on her cheeks and chin very smooth and rounded, rather than making them sharp and pointed. At this angle, her chin is going to be very wide and flat. Erase all your guidelines. Start sketching the outline of her hair. Add her eyebrows and the dots on her forehead, and start adding detail to her eyes and shading to her mouth. Add the detail on her bangs and draw in the wisps of hair that come down over her ears. Notice that her hair doesn't hang straight down; it is pulled back behind her head by two red bands, (which aren't very visible in this picture..^_^) so it rounds out by her shoulders. 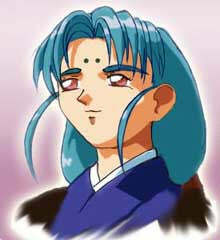 Shade her eyes and add the light glares; note that her pupils are very light, and not very prominent. Refine your sketch, erase all unnecesary lines, and try to smooth out your sketch as best as you can. If necessary, trace your sketch onto a clean sheet of paper. Shade or color your finished picture however you like. I personally like to use Adobe photoshop, but you can use any meduim you are comfortable with. Drawing a profile can be a little more difficult than a 3/4 view. 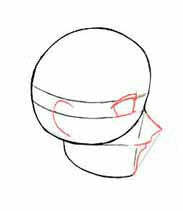 Start off with a large circle, then add the lower half of the face. 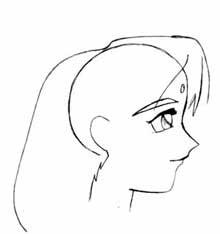 Draw the vertical guidelines as shown to help you position the eyes, and get the proper proportions for the front part of the face. Draw the curved, horizontal lines to help you position her eyes and mouth. This is one of the toughest steps, so be very careful. 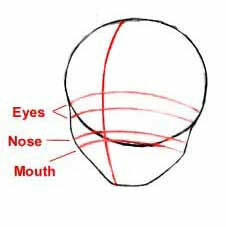 Draw the nose and mouth, making sure to stay within the guidelines. The lower lip is slightly farther back on the face, and the chin curves and sticks out slightly. It may take some practice to get the curves and angles just right. 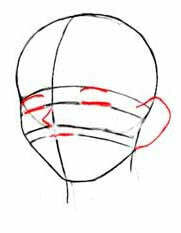 Draw in the outline of the eye and ear, as well. Erase all your guidelines. Draw her eyebrows, shade her eyes, and add the dot on the forehead. 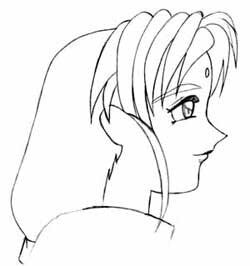 Begin sketching the outline of her hair, making sure that her hair rounds out near the base of her neck just as it did in the previous picture. Draw the rest of her hair, and add her clothing. 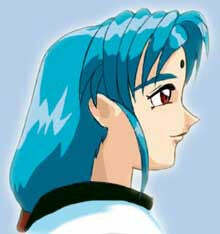 Try to make her bangs look very full and rounded, but don't make them too big; they don't extend very far past her head. Clean up your sketch and erase all unnecessary lines. Color your finished picture with whatever medium you like. Even if you do not color your picture, it is very important that you try to add some shading to give your finished work a more rounded, three-dimensional look.